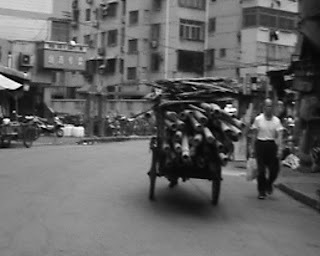 So anyway, I was coming up behind this tricycle loaded up with bamboo scaffolding and thinking “well, there goes somebody’s neighborhood” but as I passed him I noticed the trike is so overloaded that the poor guy can’t even ride it. 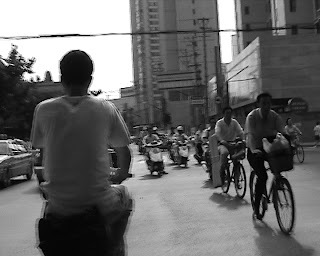 There’s no room on the trike so he’s having to push – in fact, that front tyre isn’t even touching the ground. Yes it’s too darn hot. Finally, Shanghai’s pollution encrusted palm trees don’t look out of place. 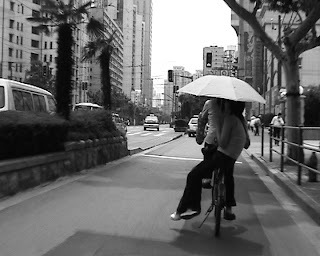 If all else fails, get your girlfriend to sit on the back of your bicycle with a parasol. The Crash Test Dummy, lacking one of these, is taking the (probably cheaper) option and going to work in a cab most days until the temperature drops below 30 again. 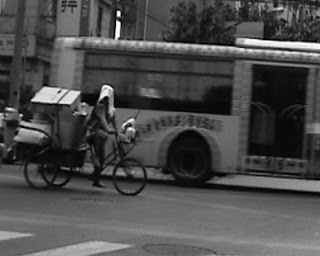 If you’re going to ride around the streets of Shanghai it really is best NOT to do it blindfold.